Dr. Ernest A. Robertson has proudly served patients at his Harlem practice for years, providing some of the finest general, restorative, and cosmetic dentistry treatments that enhance dental health and smile aesthetics. When patients come to the practice with tooth discoloration or stains, Dr. Robertson has a number of treatment options to make smiles look their very best. One of the most effective methods of treating dental stains is Opalescence Boost teeth whitening, which we'd like to consider right now. There are three kinds of dental stains. The one that most people know about is known as extrinsic dental stains. These are dental stains that originate at the topmost enamel layer of the teeth and are caused by tobacco products, foods, and beverages. Another kind of stains are referred to as intrinsic dental stains. This discoloration begins within a tooth. Intrinsic stains are usually caused by tooth injuries, infections, and genetics. The third kind of stains are age-related dental stains. This is a combination of extrinsic and intrinsic factors that occur as part of the natural aging process. Opalescence Boost teeth whitening is an ideal option for treating extrinsic dental stains and assisting in smile makeovers that address age-related dental stains. 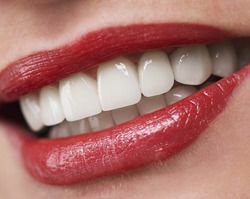 The best candidates for Opalescence Boost teeth whitening are people who suffer from extrinsic dental stains but are in otherwise good dental health. They should have have realistic expectations about the nature of Opalescence Boost teeth whitening treatment, and be aware of mild and temporary tooth sensitivity as a side effect. Patients should also keep in mind that multiple teeth whitening sessions are necessary to remove very deep or very dark stains. When patients undergo Opalescence Boost teeth whitening in the office, the treatment takes roughly one hour. A special whitening gel is applied to the teeth to help bleach stains and leave the tooth structure looking white and pristine. Since the treatment is supervised by Dr. Robertson, it's completely safe and optimal results are ensured. Some patients prefer using take-home Opalescence Boost teeth whitening. This allows them to receive the benefits of a teeth whitening treatment at home rather than in the office. The take-home kit can either be used on its own or as a supplement to in-office care. The at-home kit consists of special whitening trays and concentrated bleaching gel. Dr. Robertson will go over the instructions with each patient so that everyone who receives a whitening kit uses it properly and avoids any serious side effects or discomfort. How does Opalescence Boost compare to over-the-counter teeth whitening products? There is no comparison. Whether performed in the office or using take-home teeth whitening trays, Opalescence Boost teeth whitening is superior to the over-the-counter products available at the store. Even the best whitening strips and tray systems cannot match the safety and effectiveness of Opalescence Boost teeth whitening supervised by Dr. Robertson. The results of Opalescence Boost teeth whitening are exceptional and patients will notice their smiles looking brighter after the first treatment session. To learn more about Opalescence Boost teeth whitening and how it can help you have a beautiful smile, be sure to schedule a consultation at our cosmetic and restorative dentistry center today. Dr. Robertson and his entire team look forward to your visit and helping you achieve the most beautiful smile possible.